Just a quick blog today, because my plate is pretty full of “must do” stuff before I leave for Kansas City tomorrow. I’m looking forward to getting down there to see Alexa Jacobsen, CJ Eick, and Bob Rennison. In addition, I’ll get to see the Kansas City Mavericks play two hockey games! In the meantime, I have bills to pay, a haircut to get, and other errands to run. It will also be the first time I’ve been out of the house for more than 15 seconds since Monday. It’s been a little nippy here. Yesterday, at around 10:00 in the morning, I put a pot of water on the stove and brought it to a boil. Then I dressed for the elements because it was -27 at the time, and took said pot of water out to the front of our house. Barbara stayed inside, like a sane person. I’d tried this science trick once before, back when we lived in our former Woodbury house, on a night when it was -15, and it kinda sorta worked. I was pretty confident it would work perfectly at -27, and it did. 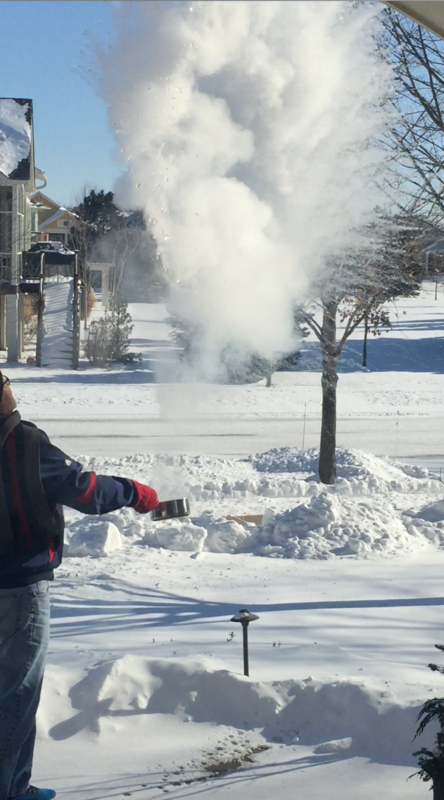 You need some confidence to throw boiling water into the air right above you. Barbara shot video of it and it’s been very popular on my Facebook page. Tons of likes and shares. I don’t have video capability here, so this is a still shot taken from the video. Worked like a charm. 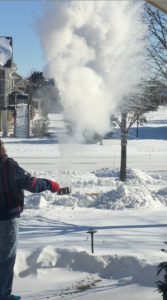 Boiling water turning instantly into fog and snow. I don’t think more than a drop or two made it to the ground in the original liquid form. I got a number of questions about using boiling water instead of cold water. Seems counter-intuitive, doesn’t it? It’s not. Boiling water is very active and full of oxygen. It’s also already in the process of turning from liquid to vapor. That’s the steam coming out of the pot. Plus, there’s the greater variance of the two temperatures. There’s 200 degree water versus 27-below-zero air. It vaporizes on the way up, as you can see here, and more of it vaporize on the way down. Almost zero of it made it down to the ground. It was REALLY cool. Right now, it’s downright balmy. We’re all the way up to -14. Actually, by Saturday, when I’m in KC, it’s going to get all the way up to 40, which will seem crazy all by itself. Even better, for me, is that it’s supposed to reach 50 or higher in KC. That’ll seem like summer! And now to the additional unforgettable moment denoted in the title. It was supposed to be in the blog last week, and I already had a photo picked out and uploaded, but for some reason I got distracted (squirrel!!!) and just finished up the blog and sent it off into the blogosphere without including this massive moment. Seems kind of ridiculous that I’d leave it out, and I actually realized that about two hours later, but by then it didn’t seem right to go back and edit because a lot of people had already read the blog. So now it’s here. I wrote about it extensively and in great detail in “Bats, Balls, & Burnouts” and I think I nailed the experience pretty well. 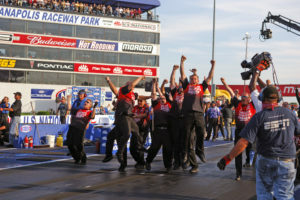 It was about a Funny Car team having about as big and successful a weekend in NHRA Drag Racing as possible. It was Indy, in 2005. As you likely know, we had earned a spot in the Skoal Showdown, a special event that was run in conjunction with the NHRA U.S. Nationals, the biggest and most prestigious drag race in the world. The Skoal deal was a special 8-car race that, just to qualify for it, you needed to earn points all season long. It was really hard to just get in the thing, and then when you did you knew you’d be racing a very good team starting with the first round. With only eight cars in it, everyone was fantastic and very fast. On Sunday, when the Showdown was held, we won round one over Tony Pedregon. Then we won round two over Robert Hight. Then we faced the late great Eric Medlen in the final and beat him too. The Skoal Showdown paid the winner $100,000. In case you’re wondering, that is indeed a lot of money. Winning a regular four-round race back then was worth $50,000. But, of course, there’s more. As you likely also know, if the winners of the Showdown were to go on and win the U.S. Nationals on Monday (that would be Labor Day every season) you wouldn’t just win the prize money for that. 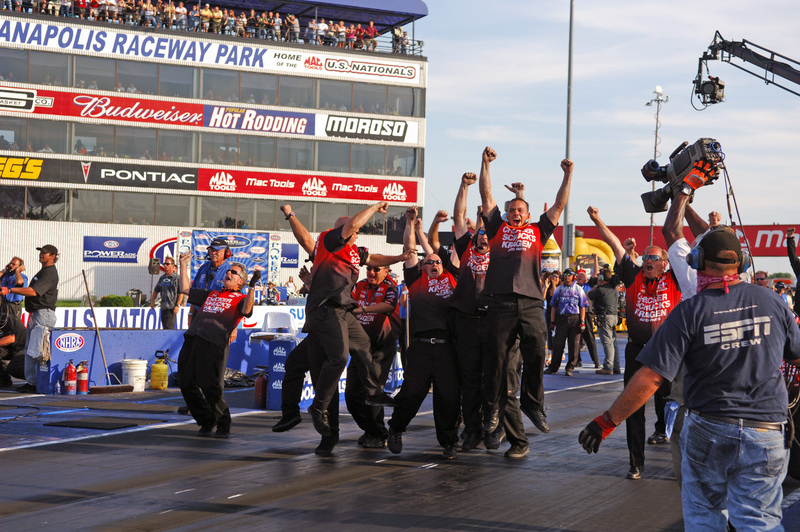 Being the biggest race of the year, the U.S. Nationals paid $75,000 to the winner. So we’d win a total of $175,000, right? Nope, there was also a $50,000 bonus NHRA paid out for any team that could “double up” and sweep the whole weekend. In prize money alone, we could possibly win $225,000 in two days. But there was even more, because we had some contingency sponsors who paid us a bonus for every race win, and our primary sponsor CSK Auto had a bonus plan with us as well. On Monday, we beat Jim Head in round one. As I noted in the book, I went back to my office in the pit area and just happened to have Eminem’s “Lose It” on my iPod speaker dock. It was uncanny that such a song would be the first one to play with the iPod in “Shuffle” mode. In round two we beat Bob Gilbertson, and Eminem played again as soon as I got back to the pit. I could hear impact wrenches squawking as the team got to work for the semifinals. We raced Whit Bazemore and beat him handily. We were going to the final round of the U.S. Nationals after having won the Skoal Showdown the day before. You know what was playing on the iPod speaker dock. And something else occurred to me then. There would likely never be a single round of drag racing in my life and career any bigger than this one. The only way there could be would be for us to have to win the final round at the final race to take home the Funny Car championship. That rarely happens, and we had never been closer than a distant second place on the last day of any season. If we won in Indy, we’d make some history and an awful lot of money. If we lost by an inch, no one would remember. And we’d go home with about $100,000 less than if we won. The contrast was so stark. It really seemed like an “all or nothing” deal, despite the $100,000 we’d won from Skoal. As I wrote in the book, Eminem played again. The hair on my arms stood up again. The minutes were simultaneously flying by and crawling. It was the weirdest sensation. I was having a lot of deep thoughts. As a baseball guy, I know all about dramatic “walk off” home runs that win games in the bottom of the ninth. It’s as thrilling as it gets. One second, the pitcher is getting his sign and ready to throw. A second later, the ball rockets off the hitter’s bat and heads for the fence. Then there’s mayhem. It struck me, for the first time, that such a thing happens in nearly every final round of a drag race. The only time it doesn’t happen is the exceedingly rare time one of the contestants can’t make it to the line and the other racer gets a solo pass to the win. In my career, I don’t believe I’ve ever seen that. I’ve been part of teams that purposefully stalled just to let the other team get there, even with NHRA officials demanding we start the car. On that Labor Day afternoon in Indy, as we pushed the car to the line to race our former teammate Frankie Pedregon in the final, two things were in my head. The first was that I thought I was going to faint and was momentarily worried about my health. Then I realized I was so nervous I wasn’t breathing. The second was the enormity of the moment. Not just any “walk off” result was right ahead of us. This was the U.S. Nationals, and we’d already won the Skoal Showdown. It was too huge to imagine. It scared me. As our entire team stood behind the car, no one knew how it would end. We didn’t have an 8-run lead with two outs in the bottom of the ninth. We weren’t ahead by four touchdowns at the two-minute warning. There would be no comeback. Two cars would go down the track and one would win. The other team would walk away. When it gets like that, the amount of emotion inside you is beyond belief, but none of it can come out until one car crosses the finish line first. That moment. It’s hard to explain. Our car did. Our driver, Del Worsham, won the U.S. Nationals. And this is what it looks like to feel that. Do yourself a favor and click on this photo to enlarge it . Look closely at the faces. Look at the emotion. This scene, right here, is the moment I felt the most unfiltered and unrestrained excitement I have ever felt. It was almost too monumental to grasp. It was like an explosion within all of us. And you know what? The money wasn’t the reason we were so excited. Del might have thought about the money, since he and his dad had to run the operation, but the rest of us were just thinking of making history. I’m not in the photo because my job was to videotape every run by kneeling over by the wall. I was always the last one to the winner’s party, but that didn’t matter. You can see the burly arms of ESPN camera operator, and my buddy, Dana Sherman, holding his camera and getting the “reaction shot” of our team. I’m probably just getting up from my kneeling position right next to him. I remember the celebration because it was unlike any we’d ever had. We were all levitating and jumping up and down, and as a group we kind of moved around as a unit there, behind the starting line. It was totally impromptu and organic. It just happened. I remember piling into the tow vehicle SUV and riding down to the top end to get Del and the car. I called Barbara and didn’t realize how emotional I was. All I could say was “We did it” and that was the last thing I could utter. It was one of the most unforgettable things I’ve ever been a part of. And I’m still so proud of those guys, and of Del, and of everyone who was a part of it. I’ll never forget it. So that’s it for today. This hair isn’t going to cut itself. I gotta run. If you just read this and enjoyed it, please do me that weekly favor of clicking on the “Like” button at the top. See you next week with tales of hockey and friends. Bob Wilber, at your service and still amazed by the 2005 U.S. Nationals and the team that won it all.